Get a taste of how Big Boss runs his "army without a government" by playing the Metal Gear Solid: Peace Walker demo, no longer only in Japanese. 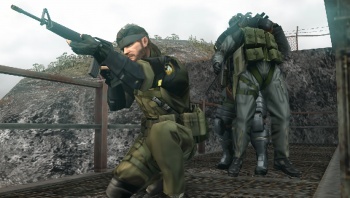 The wait until Metal Gear Solid: Peace Walker's May release date just got a bit easier. Konami announced today that the demo for the upcoming PSP Metal Gear installment will be available on the PlayStation Network later today. This is for both North America and Europe, satiating the worldwide need for more Snake. A Japanese demo has been available for a while now, but for those who don't speak Nihongo it was tough to understand the storyline. I'm looking forward to getting a chance to see what's actually going on in a coherent manner rather than in this trailer's jumbled mess of awesome. As long as someone yells "Snaaaaaaaaaaaaake," I'll be happy. The demo should feature the same content available in the Japanese demo, and more, including four mission types. Metal Gear Solid: Peace Walker is back in the hands of Hideo Kojima for this go-around, with Konami billing it as a sequel to Metal Gear Solid 3: Snake Eater. True Metal Gear fans will probably not want to miss out. As of this writing, the demo was unfortunately not yet available, but update that PSP firmware and keep an eye out later today. Peace Walker is scheduled for release in North America on May 25, in Europe on May 28, and in Japan on March 18.